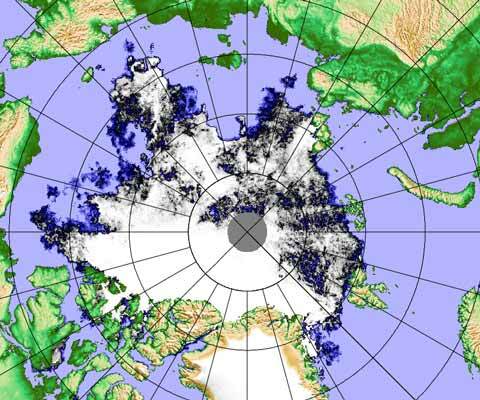 White areas have high concentrations of ice, fading through grey, black (about 50% ice, 50% open water) and then dark blue to no ice at all (click the image to see the latest updated version with key). It looks to me as though there are very large areas of low concentration ice — some very near the Pole, something confirmed by looking at the MODIS Arctic Mosaic daily satellite images. Some of that low concentration ice will probably melt out before the autumn freeze-up begins, but how much is a very open question. It’s possible that the 2008 minimum could be beaten, particularly if wind compacts regions of ice that are currently well scattered. The best place to monitor the melt season denouement, the final furlong, or as Neven prefers to call it, the fat lady’s closing chorus, is at his Arctic Sea Ice blog. He’s devoting a great deal of time and energy to covering the melt, and his commentariat are contributing a lot of interesting perspectives. It is obvious that the conditions met by the early explorers such as Vitus Bering, Fridtjof Nansen, Adolf Erik NordenskiÃ¶ld and Roald Amundsen no longer exists. We passed through in a few weeks, while our predecessors were forced to overwinter once or even twice. Still, it is not an easy passage for any kind of boat or vessel.